A company that is so obsessed with productivity and efficiency - for them to make a game or several games and logos over the years - that leads to so much wasted productivity is always interesting to me. The latest? 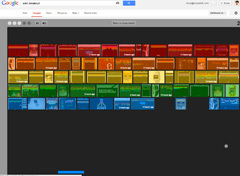 Go to Google Images and search for [atari breakout] and you will get the game. I play for like 5 minutes just to record it. You can watch the recording in high speed below. Only 38 seconds to beat the first level. :) Well, not really. This is pretty cool but ugh, no time to waste today.